The seven Classical “wanderers” of the sky have a special importance in Alchemy. Each planet is linked to a different metal (Sun to gold, Moon to silver, Saturn to lead, etc. ), and the planetary influences were depicted in Basil Valentine’s VITRIOL emblem, which is shown at left. Where did the esoteric significance of the planets come from? For that, we’d have to go back several thousand years, when the Babylonians and the Assyrians built gigantic stepped ziggurats that led up to the abode of the gods. 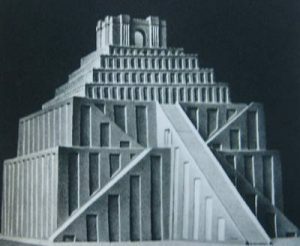 Gudea’s temple has seven stages, and most importantly, it’s marked out according to the regulations of the “pure stars of heaven.” It would be difficult to escape the conclusion that the ziggurats of Mesopotamia represented a ‘stairway to heaven,’ and an ascent through the planets to the abode of the gods. The correspondences here, between planets and metals, are similar to the scheme that would later be held by Alchemists, while the planetary ladder echoes the ascent on the stairs of the Mesopotamian ziggurats. 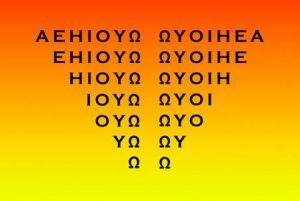 This echoes John of Patmos’ Book of Revelation: “I am the Alpha and the Omega.” But we should keep in mind that there’s no indication that Jesus spoke Greek, and therefore those words show a strong Hellenistic influence on the Book of Revelation. Martianus goes on to describe the seven Liberal Arts, laying the foundation of Medieval university education, and by extension, the basis of today’s higher education. Kepler’s Laws of Planetary Motion led to our current Space Age (as they are still used today to calculate celestial orbits), and therefore we can thank the Pythagoreans, who were seen as direct ancestors by the Alchemists, for the monumental progress in the physical sciences today. And when Muslim pilgrims arrive at Mecca, their first duty is to circumambulate the Ka’aba, the central shrine of all Islam. The first three circumambulations are to be done at a fast clip (like the quick orbits of the three inner Planets), while the remaining four circuits can be done at a more leisurely pace (like the slower orbits of the outer Planets). Perhaps practicing Pythagorean dissemblance, Dio describes a musical scheme which is not incorrect, but which gives a misleading descending order from the highest planet, Saturn, according to the weaker musical interval of the Fourth (skipping two notes or planets). The more correct, stronger musical interval would be that of the Fifth (skipping three notes or planets), which gives an ascending, complementary order starting from the Moon, going to Mars, to Mercury, to Jupiter, to Venus, to Saturn, and then to the Sun, the star at the very heart of our planetary system. Next time you wake up on Monday (Moonday) morning, consider if you will the Odyssey through the Planets that’s been planned out for you thousands of years ago, for the next seven days, to the furthest reaches of the stellar firmament. 1. The Oxford Encyclopedia of Archaeology in the Near East, edited by Eric M. Meyers (American Schools of Oriental Research, 1996). 2. The Form and Nature of E-Pa at Lagash, by George A. Barton, Journal of the American Oriental Society, Vol. 43 (1923), pp 92-95. 4. The Literature of Ancient Sumer, by Jeremy Black, Graham Cunningham, Eleanor Robson, and Gabor Zolyomi (Oxford University Press, 2004), p. 49­–50. 5. Celsus, On the True Doctrine – A Discourse Against the Christians, translated by R. Joseph Hoffmann (Oxford University Press, 1987), p. 95. 6. The Ancient Egyptian Pyramid Texts, R.O. Faulkner (Clarendon Press, 1969), p. 76. 8. The Ancient Egyptian Coffin Texts (Vol. 1), R.O. Faulkner (Aris & Phillips, 1973), p. 78. 9. The Pythagorean Sourcebook and Library, Kenneth Sylvan Guthrie (Phanes Press, 1988), p. 77. 10. The Republic of Plato, translated by Allan Bloom (Basic Books, 1968), p. 300. 11. Cicero, The Republic, translated by Niall Rudd (Oxford University Press, 1998), p.90. 12. The Mystery of the Seven Vowels: In Theory and Practice, Joscelyn Godwin (Phanes Press, 1991). 13. The Greek Magical Papyri in Translation, by Hans Dieter Betz (Univ. of Chicago Press, 1997), p. 323, PGM CXXX. 15. The Theology of Arithmetic, Attributed to Iamblichus, translated by Robin Waterfield (Phanes Press, 1988). 16. Sefer Yetzirah – The Book of Creation, In Theory and Practice, by Aryeh Kaplan (Samuel Weiser, 1997), p. 165-166. 17. Dante Alighieri, The Paradiso, translated by Henry Wadsworth Longfellow (Barnes & Noble Classics, 2006), blurb on back cover. 18. Stephen Hawking, On The Shoulders of Giants, (Running Press Book Publishers, 2002), p. 670. 19. Josephus, Antiquities III, 183. 20. Philo, Volume VI, “On Moses,” (Loeb Classical Library, Harvard University Press, 2002), p. 499. 21. Dio Cassius, Roman History (Books 36 – 40), translated by Earnest Cary (Harvard University Press, 2001), pp 129 – 131. Of course the first step was to find a Salt of Tin that fit the description of the reaction taking place, a chemical which burns when exposed to air. I found out that only one salt of tin combusts in air, stannous bromide, or tin (II) bromide. The chemical being identified, I moved on to trying to figure out how an alchemist in the 17th century would have been able to manufacture the chemical. My first investigation along these lines was to find out how such a chemical could be synthesized without exposing it to air. The excerpt makes reference to keeping the salt well stopped, but before that makes absurd suggestions of how the material should be handled. They are absurd because it does not take into account the behavior of the substance when in the presence of oxygen. It is known that alchemists often would intentionally obscure their own writings, to keep the inexperienced from stealing their knowledge. This led to the question of how an alchemist would distill stannous bromide without exposing it to air. A stoppered container heated would explode and a distillate exposed to air would burn. When any solution is heated in a container, several things happen. As the air in the container is heated, it escapes from the container to maintain equal air pressure with the air outside of the container. Also, as the solution is being heated, its vapor pressure begins to equalize with the atmosphere inside and outside of the container, it does this by expelling air from the container. As air is heated, its pressure rises, and since the volume of the container is fixed, air must be expelled from the container. When a liquid vapor pressure equals the pressure of the surrounding atmosphere, it begins to boil. This is important. It is not hard to imagine that with constant work spent on heating substances, that eventually one of the alchemists would have stumbled on a phenomena involved with vapor pressure. If a container filled with an amount of solution is stoppered and rapidly cooled with an ice bath, two things will happen. The air pressure within the container will fall, and as the temperature falls, so does the pressure. The liquid, still containing much of the energy from the heating, will not cool as quickly, and so, because the solutions vapor pressure is still very high, and the air pressure in the container is very low, the liquid would boil. So the alchemist would boil the solution until it was just about to sputter, pop, and the solute would be exposed to air. Then the alchemist would stopper the container, and place the container in an ice bath. For a day I was stumped with how an alchemist would be able to produce and ice bath without a freezer. Then it hit me. In the 17th century Europe was still in the grip of the “Mini-Ice Age”; so, for at least one fourth of the year, there would have been a ready supply of snow and ice in just about any spot in Europe you would care to look. Having solved the problem of this part of the synthesis of the chemical, my efforts turned toward finding the source of tin and bromine used in this operation, which has proved to be the most difficult part of the construction of this hypothesis. Elemental tin is found from many sources. The most attractive to the medieval alchemist, due to the peculiarity of their discipline, would have been a plant source. This is because it fit their view of the world, in which plants, minerals and animals had an inner essence, which could be distilled and transmuted from plant to mineral, mineral to plant, and all other combinations possible between those three. A plant very common in Europe, which contains 67 ppm of elemental tin, is the plant Elymus repens, commonly known as couchgrass. This plant is considered a weed, so it would have been readily available in large amounts, crucial because the amount needed to produce a sizable amount of tin would have been immense. The issue of the bromine is probably the most troublesome. Bromine was not discovered as an element and a pure substance until 1860, by Antoine Ballard in the salt marshes of Montpellier. Bromine can be recovered from brine wells and the Dead Sea which has a concentration of approximately 5000 ppm. Evidence that anyone in Europe knew this however, is currently non-existent. This is of course, the bare skeleton of a hypothesis. More research will be needed to flesh it out, and then extensive testing in the lab and even more research of the history will be needed to produce a historical model and chemical theory as to how this chemical was produced four centuries ago. So says the acclaimed author David Ovason in his radical 1997 interpretation of the prophecies of Michel de Nostredame, The Secrets of Nostradamus, with reference to the use of the aviantongue by the legendary French apothecary and mystic in his “obscure” and “crabbed” quatrains. However, the seer of Saint-Rémy-de-Provence was by no means alone in his employ of this brilliant technique (or collection of techniques) of linguistic obfuscation. The Great Alchemical Work is an important contribution to the study of alchemy. In the first English language edition of this ‘little work,’ Portuguese alchemist Rubellus Petrinus presents a sincere and invaluable guide to the operative laboratory tradition that gave birth to the Art of Hermes and its vast literature. Taking as his starting point the classic works of three well-known Adepts – Eirenaeus Philalethes, Nicholas Flamel and Basil Valentine – Rubellus offers aspirants a clear explanation of these highly cryptic, often deliberately misleading, texts. According to Frater Parush (A.H.S. ), in his preface, “… the interested student will find herein one of the best publications now available of the accurate and proper understanding of some important pieces of classic alchemical cypher. Rubellus removes a good portion of the veil from over the works of Flamel, Valentine and Philalethes concerning the Great Work, and thereby opens the door to a wider understanding of other related literature.” Drawing upon his more than thirty years of discipline and experience, Rubellus generously shares his knowledge that has had “all that is superficial removed from it,” and daringly exposes the facts of the secret processes of the Art. 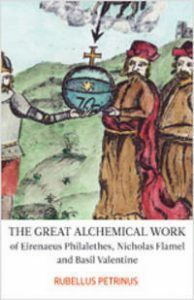 The Great Alchemical Work features full colour plates with photographs of alchemical processes, products and equipment, along with rare reproductions of early woodcut versions of Basil Valentine’s famous Keys. Rubellus Petrinus was born in Bragança, Portugal, in March 1931. As a young man, he traveled to Angola where he worked in telecommunications and pursued his hobby as a ham radio operator. After reading Le Matin des Magiciens by Louis Pauwels and Jacques Bergier, he became determined to experience and understand alchemy. Although far removed from the hub of European alchemical activity, he continued his studies by reading the works of Fulcanelli. As Angola moved towards independence, he returned to Portugal and settled in Queluz, near Lisbon. For the next three decades he continued his pursuit of the Great Work, studying operative alchemy in France, Spain and his native country with the Master Solazaref, Simón H. and Roger Caro. Having made substantial progress on numerous paths – including the Dry Way, the Wet Way and the way of Kamala Jnana – he continues towards the realisation of the Philosopher’s Stone, and the fulfillment of a lifetime of study and practice. The work of alchemist Roger Caro is available in English translation and 40 photos from his lab work are now posted athttp://www.rexresearch.com/caro/caro.htm . Alchemist Arion Love has notified us that a free movie on the growing threat of corporate control is now available. Click here to view. The movie is called “Endgame: Blueprint for Global Enslavement and the website is at http://www.endgamethemovie.com . Jeff McBride sent this video link of the transformations of the Moebius. There is a Hermetic component here too. It shows so wonderfully how the infinite forms of the Moebius originate in the One, which mathematically is the sphere which projects as a circle. Just like our reality. As Above, so Below. Go to http://www.youtube.com/watch?v=JX3VmDgiFnY&NR=1 . In September 2007. John Reid’s Golden Vessels was spun off to become its own entity, and the new company name is Golden Vessels Corp. Spagyria, Inc. will continue to function as an educational center for alchemy. Please go to www.spagyria.com for more information. You can now buy complete sets of Essentia Magazines for $150 and Gently for $65. Those persons who have previously ordered these items at full price will receive a refund for half their original purchase price. For more information go tohttp://www.spagyria.com/specials/FraterAlbertusLegacyPublications.asp . Writers Wanted! The Alchemy Journal is always looking for articles on any aspect of alchemy, including biographies, historical material, practical laboratory work, spagyric recipes, philosophical pieces, poetry, experiences in personal transformation, spiritual insights, Hermeticism, Gnosticism, book reviews, film and video reviews, website reviews, artwork, etc. Please submit your material or queries via email to our editor at alchemyeditor@yahoo.com. Community Feast: Nourish your body, mind and spirit as you reconnect with old friends, and meet new friends! CandleDance: A techno-tribal dance extravaganza, featuring live DJs and performance art, hosted by ArchMage Jeff McBride! Exciting new workshops: Grow your mind, flex your body and let your spirit soar with ours! DreamCircle Alchemy: Creating sacred space to explore and empower our dreams and bring them to life! Mysterium Ritual Theater: All night, indoor, sacred fire circle, with drumming, dancing, spoken word, chanting and spontaneous ritual offerings! Due to space limitations, registration is limited to the first one hundred participants. Registration for the entire weekend, is only $75, which includes all events, workshops, and meals (Potluck Feast, Breakfast on Sat and Sun, Potluck dinner Sun. night) Limited work trade is available for those in need. Call Spinner at 702-450-0021 to discuss the possibilities. July 7-10, 2008. MEDIEVAL CONGRESS in Leeds, England. October 10-12, 2008. INTERNATIONAL ALCHEMY CONFERENCE in Las Vegas, Nevada. 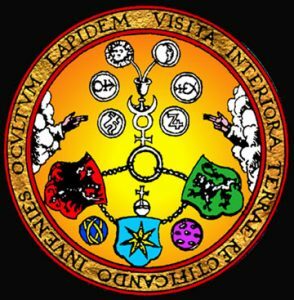 The second International Alchemy Guild (IAG) is currently organizing what looks to be another powerful gathering of alchemists and alchemical practitioners. The goal is to represent all aspects of alchemy, including the practical and spiritual paths, East and West, and modern perspectives such as transpersonal psychology. The event is scheduled to take place over the Columbus Day weekend in Las Vegas. Deep discounts are offered now for early registration. Complete information is at www.AlchemyConference.com . For a complete listing of other current lectures and workshops on alchemical topics, please go towww.AlchemyConference.com/lectures.htm . The film revisited the case of the beauty and the beast. As the story goes, in the beginning it is the beast Quasimodo (Charles Laughton), who possessed of a strange admiration of the beauty of the gypsy girl Esmeralda (Maureen O’Hara), tries to kidnap her. It is the knight Phoebus (Apollo, the Sun-god, the light of the Sun) who quickly rescues her. Quasimodo is charged with the felony and condemned to public slashing. However, while the torture was taking place the only person who would calm Quasimodo’s “thirst” is Esmeralda. Esmeralda falls in love with Phoebus who while embracing her, is killed by a jealous priest who wanted to selfishly possess her. Irrational dogmatism is exemplified by the corrupted clergy who would commit even the murdering of Phoebus and therefore obscure the light from heavens, in order to obtain the elusive Esmeralda. Esmeralda is charged with the murder and condemned to death. The kindness of another priest, neither the authority of the clerical law represented by a questionable court (through biased procedures) nor ultimately the king (through superstition) was good enough to save the innocent girl. It was Quasimodo (Latin for “the almost done”, “the incomplete”, “the unfinished”), representing the lower stage of humanity, (but still capable of love), who successfully attempts, while risking his own life to save the beautiful Esmeralda, the process to Real Beauty. Editor Duane Saari is leaving the journal to pursue his further growth in alchemy. We are all sorry to hear he is resigning as editor, and we wish him the best of luck in his continuing alchemical journey. He has done such a great job and really brought in some great writers. Thank you, Duane, for a job well done! The new editor of the Alchemy Journal is Paul Hardacre. He will take over with the Spring 2008 issue. As the third editor of the journal, he is extremely well qualified to continue our tradition of excellence in spreading alchemical knowledge in the modern world. He is the managing editor of “papertiger media,” publishers of poetry and literature. Paul is a recognized poet himself and samples of his work can be found in past issues of the Alchemy Journal. His works explore the mysteries, hermetic and alchemical cosmology, cabala and the ‘green language’, occult and devotional systems, the reconciliation of opposites, and death – both familial and mythological. With his long-time partner, artist and graphic designer Marissa Newell, he currently divides his time between Brisbane, Australia, and Chiang Mai, Thailand. His publishing company is Salamander and Sons ( www.salamanderandsons.com ), and his latest release is Rubellus Petrinus’ The Great Alchemical Work, which is reviewed above. We all wish to welcome Paul to the stewardship of the Journal and pledge our support and creative energy to keep this publication the most unbiased, up-to-date, and complete alchemy magazine available anywhere. More than four years ago, I gladly accepted, even embraced, the opportunity, to become the editor of the Alchemy Journal. This was an opportunity to not only shape the Journal as a tap into the underground stream where the essence of alchemy flows, but to reveal how alchemy is alive and present in our daily lives. It was also a chance learn more about myself and my journey’s end. With the publication of 16 issues of the Journal since the summer of 2003, I know more about my journey and what is now required of me. Whether or not this publication revealed anything about alchemy to you, my readers, or you found it “refreshing and invigorating” as I hoped, only you can say. There are no regrets. My only wish is that you, my readers – practitioners of alchemy, students of the Art and seekers of its wisdom – and I had come to know one another more. Perhaps through my writing that is emerging, the presentations I’ve scheduled and the travel I will do, this will happen and a fellowship of alchemy will begin to form. If you are moved to share your experience as a reader of the Journal or a follower of the principles of alchemy, contact me atduanesaari@hotmail.com. You will find me there huddled with an ancient manuscript or gathering dew in the early morning following a full moon or marveling at my latest revelation of the phases of alchemy in my daily life.